Frazier & Son’s new easy-to-clean incline conveyors feature robust stainless steel, sanitary construction with a quick-release fold-out side board and belt lifter system for fast toolless washdown. The belt’s sealed edges prevent contamination. Incline conveyors provide gentle, reliable material handling in food and packaging applications and are available in horizontal, incline, and Z-shape configurations. Frazier’s incline conveyors are designed for high-end applications with heavy-duty sanitary construction, the elimination of tuning, hollows and harborage points, continuously welded standoffs and seams, and minimal use of fasteners. The unit’s continuous carry-way support maintains control of the belt and the positive drive belting and dynamic guides ensure reliable tracking. 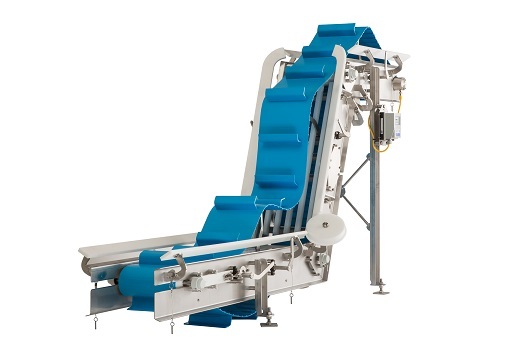 These inclines offer design features that speed cleaning, washdown, and belt changes. They include hinged belt guides, rollers and sideboards, a quick-release belt tensioner, and belt lifters to raise the belt off the frame. The carry-ways lift out without tools, and the conveyor’s cantilever frame design, along with the use of a welded-splice endless belt, makes belt removal a snap.